The story about the school closing was just CNN continuing with hissy fits on behalf of the Democratic Party and their dear leader Obama. Forbes has the details on the false school-closing story, which was picked up by several news outlets including the Daily Mail. By the way, CNN is behind House & Garden TV in the cable ratings. Mr Putin did not order the Anglo-American school in Moscow closed. It was a false news story put out by CNN. Putin said that unlike the Obama administration, Russia will not target foreign diplomats and their families days before New Year’s celebrations. On Thursday unmarked SUVs surrounded a Maryland property belonging to the Russian Embassy to the United States to send a clear signal: Russians are not welcome anymore. The Obama administration designated the vacation retreat as a compound used for ‘spying purposes’ without expanding on what kind of spying was going on in the remote location. Unsurprisingly, it is extremely difficult to justify intelligence gathering here, as no military base or government building can be found anywhere nearby and everyone in the neighborhood has known for decades that the spot is a retreat for Russian diplomats and their families. If you had been a spy, coming here would be the best way to blow your cover. Nevertheless, this quaint family vacation spot is what the US has targeted in their latest round of sanctions. The data in the report may be incomplete as it doesn’t include India -- or China, where the Christian community survives in secrecy, he added. A reporter for AMN has put together the list. The ceasefire goes into effect at midnight in Syria, which is 5:00 PM EST, so it happened a half hour ago. Recent search operations in eastern Aleppo have confirmed that chemical weapons were indeed used during the conflict – but by terrorists, not government forces. Earlier this year Samer Abbas, spokesman for the Syrian National Authority monitoring the implementation of the Chemical Weapons Convention, contacted the Organization for the Prohibition of Chemical Weapons (OPCW) and presented documented proof of terrorists using sulfur mustard ordnance against civilians in Syria. OCPW declared that a special committee to confirm the veracity of these documents needs to be created, but so far have apparently refrained from pursuing this line of inquiry for reasons unknown. Obama sanctioned two Russian intelligence agencies, the GRU and the FSB, four GRU officers and three companies "that provided material support to the GRU’s cyber operations. Russian President Vladimir Putin announced a ceasefire between Syrian opposition groups and the Syrian government starting at midnight on Thursday. The parties were also prepared to start peace talks, Putin said, after Moscow, Iran and Turkey expressed readiness to broker a deal to settle the nearly six-year-old Syrian war. The Syrian army announced a nationwide halt to fighting but said Islamic State and ex-Nusra Front militants and all groups linked to them would be excluded from the deal. It did not say which unnamed groups would be excluded. A spokesman for the Free Syrian Army, a loose alliance of rebel groups, said it would abide by the ceasefire, due to come into force at 2200 GMT, and take part in future talks. "The agreements reached are, of course, fragile, need a special attention and involvement... But after all, this is a notable result of our joint work, efforts by the defense and foreign ministries, our partners in the regions," Putin said. He also said Russia had agreed to reduce its military deployment in Syria, where its support has turned the tide in favor of President Bashar al-Assad in a war that has killed more than 300,000 and forced more than 11 million to flee their homes. Putin spoke by phone to Assad who said he was committed to observing the ceasefire, the Kremlin said. Turkey said it and Russia would guarantee the ceasefire. "This window of opportunity should not be wasted," Turkish President Tayyip Erdogan said. Three rebel officials told Reuters the deal excluded Islamic State, but did include the Jabhat Fateh al-Sham group, formerly al Qaeda's Syria branch, the Nusra Front - appearing to contradict the Syrian army's statement. The Free Syrian Army spokesman said the ceasefire also does not include the Kurdish YPG militia, which has mostly avoided conflict with the Syrian government. The YPG could not immediately be reached for comment. Russia's defense ministry said insurgent groups that signed the agreement included the powerful Islamist Ahrar al-Sham, Jaish al-Islam, which operates primarily near Damascus, and Jabha Shamiya, one of the main Turkey-backed FSA groups that had operated in Aleppo. However, a spokesman for Ahrar al-Sham said it had reservations about the agreement and had not signed it. The United States has been sidelined in recent negotiations and is not due to attend the next round of peace talks in Astana, capital of Kazakhstan, a key Russian ally. Its exclusion reflects growing frustration from both Turkey and Russia over Washington's policy on Syria, officials have said. However, Russian Foreign Minister Sergei Lavrov said the United States could join the peace process once President-elect Donald Trump takes office next month. He also wanted Egypt to join, together with Saudi Arabia, Qatar, Iraq, Jordan and the United Nations. Washington said the news of a ceasefire was a positive. "We hope it will be implemented fully and respected by all parties," State Department spokesman Mark Toner said. The United Nations Syria envoy, Staffan de Mistura, welcomed the ceasefire announcement and hoped it would save civilian lives, enable the delivery of aid and lead to productive peace talks in Astana. The deal should also help U.N. negotiations on Syria to be held in February, de Mistura's spokeswoman said. During the past couple days I have seen reports that scores, perhaps as many as 60, sappers and troops have lost their lives during the massive demining/bomb defusal operations in East Aleppo. The mercenaries wired everything they could, including toys and kindergartern rooms, with explosives before they decamped. That's in addition to the landmines they buried. And there is a massive cleanup underway in E. Aleppo neighborhoods; I think it was yesterday that I saw a photograph, maybe at FARS or Sputnik, of a tractor clearing rubble from a street in E. Aleppo. Then will come tearing down unsafe buildings, then a start on reconstruction. I am very much hoping that China and India, and perhaps Japan, can finance and handle projects for the most critical infrastructure repairs/rebuilding in East Aleppo. TEHRAN (FNA)- A large number of Syrian families started returning to their homes after all terrorists were forced out of the Eastern districts of Aleppo city. Hundreds of families from Eastern Aleppo's Seif al-Doleh are now back to their houses after the Syrian and Russian troops finished defusing mines and bombs planted by the terrorists. The Russian Peace Coordination Center in Syria announced on Wednesday that the country's experts have cleared mines from 966 hectares of the newly-liberated neighborhoods of Eastern Aleppo city since December 5. The Russian center said in a statement that an area as large as 966 hectares (each hectare equals 10,000 sq. m) has been cleansed from mines and bombs planted by Jeish al-Fatah coalition of terrorist groups in the Eastern neighborhoods of Aleppo city. The statement added that approximately 350 km of roads, 2,149 houses, 44 schools, 38 mosques, ten hospitals and clinics, a water pumping station and two power transition stations and a water treatment plant have been demined. The statement added that the Russian soldiers managed to defuse over 14,700 bombs including 6,700 handmade grenades. On Thursday, the last batch of terrorists and their families left the neighborhoods of Al-Zobaydiyeh, al-Ansari and Salahuddin East of Aleppo. The Syrian Army and its allies from the resistance front made history and took back the country's second most important city from thousands of terrorists in a landmark victory that will change the future of the war in Syria. The last pocket of terrorists left Eastern Aleppo on Thursday evening, meaning that the Syrian army and its allies purged all city districts of Jeish Al-Fatah terrorists and completed control over the entire city. Syria has been grappling with deadly unrests since early 2011, and only after two years, Damascus found itself under the siege of a variety of terrorist groups overtly and covertly supported by the western powers and their regional allies -- especially Qatar, Saudi Arabia, and Turkey. TEHRAN (FNA)- Iranian Red Crescent Society (IRCS) Managing Director Seyed Amir Mohsen Ziyaee announced that his country has sent over 140 tons of humanitarian aid to the people in Aleppo. "Given the problems that people in Aleppo have been facing, we had sent several cargos of aid to Aleppo before. In addition to that, we sent two 70-ton cargoes on two planes to Aleppo which included medicine, tents and other goods needed by the people," Ziyaee said, addressing a meeting in Tehran on Tuesday. Iranian President Hassan Rouhani announced after talks with his Armenian counterpart Serzh Sargsyan in Yerevan earlier this month underlined that Iran and Armenia agree on the necessity for dispatching humanitarian aid to the people in Aleppo. "We discussed Iraq and Syria as two countries which are facing the problem of terrorism today and we should help these governments to uproot terrorism and we agreed on sending humanitarian aid, specially to the Aleppo people," Rouhani told a joint press conference with Sargsyan. Thank you people of Iran for all your sacrifices to defend the people of Syria, and thank you and Iran's Red Crescent Society for the aid. God bless you. FARS has photographs. Thank you, FARS, for letting us know; it means a lot to me. Thank you, Russian people for sending the presents. And thank you for your sacrifices to defend the Syrian people. God bless you. Pourquoi copiez-vous autant de photos de mon blog? The report titled, “Keeping the Lights On in Rebel Idlib,” describes a city so dangerous and dysfunctional the authors could not even venture there to conduct their interviews. Just as is happening across Aleppo, when areas are finally returned back to Syrian control and the supply of foreign aid, weapons and support is removed, so too is the illusion of opposition. A report published by The Century Foundation (TCF), a US-based policy think tank, helps shed light on the inner workings of the small northern city of Idlib, Syria. Idlib is to US State Department-listed foreign terrorist organization Jabhat Al Nusra (also known as Jabhat Fateh al-Sham or Al Qaeda in Syria) what the eastern Syrian city of Al Raqqa is to the self-proclaimed “Islamic State” (IS). And while great hope resides within statements of US, European and Gulf state politicians, echoed across their respective media platforms for this city’s possible role as an alternative “capital” for an alternative “government,” opposed to the current Syrian nation-state, TCF’s report dumps a cold bucket of water on what was but a spark, not even a flame of hope. The report titled, “Keeping the Lights On in Rebel Idlib,” describes a city so dangerous and dysfunctional, the authors of the report could not even venture there to conduct their interviews, which were instead conducted remotely from the other side of the Turkish-Syrian border. The report even admits that the “provincial council” meant to replace the Syrian government remained based in Turkey for years and still maintains an office there today. The report points out that armed groups compete not only for influence within Idlib, but also for access to the constant stream of resources foreign donor organizations provide. The report admits that this foreign aid (dominated by USAID) sustains Idlib’s occupiers, who themselves lack the ability to unify the city, fund any of their activities, let alone challenge the Syrian state. The report also admits that initially the Syrian government was able to protect Idlib’s urban centers, and that they only fell after the Bab al-Hawa border crossing with Turkey was taken over. This suggests that an influx of weapons, supplies and fighters over the border from Turkey, with Turkish and other state-sponsors’ backing, helped turn the tide against Syrian forces, not the momentum of the “uprising” itself. Idlib province is now one of the few regions in the country that still has an unsecured border with Turkey, making it no surprise that Idlib remains one of the few areas still left beyond the Syrian government’s control. The report also admits terrorist organizations (Ahrar al-Sham and Al Nusra) dominate this remaining region, contrary to US and European rhetoric. Even if the US and its allies believed it was politically possible to announce Idlib as an alternative “capital” to Damascus, Idlib in reality could never serve such a role. Between its small size, the fact that it is transparently dominated by armed terrorists and completely dependent on foreign aid means that Idlib cannot even administer itself, nor the province it resides in, let alone the entire country. Any nation subjected to “rule” from the failed city of Idlib, would without doubt be a failed nation. All Idlib could ever be used for is the illusion of viable opposition. The city and province’s administration is as artificial as the armed conflict its current state of dysfunction resulted from. Both city and provincial administration depend entirely on foreign support that is interested only in the overthrow of Damascus, not Idlib’s peace and prosperity. Like Afghanistan, Iraq and Libya, once the war is over and regime change accomplished, contractors will seek to make as much money “nation building” as possible, interested more in returning home to spend their new fortunes than leaving behind a functioning and “free” nation state. The report concludes with the question of whether or not the Syrian government could reassert itself in Idlib. The Syrian government possesses absolutely everything the current “administrators” of Idlib lack, namely unity, ability and resources. Just as is happening across Aleppo, when areas are finally returned back to Syrian control and the supply of foreign aid, weapons and support is removed, so too is the illusion of opposition. Mass graves of torture victims found in E. Aleppo. That plus a penny. He said that the instances are being recorded as serious war crimes and will be given maximum publicity "so that European backers of the so-called opposition in London and Paris are well aware of who their [friends] actually are." I don't share the Russian government's hope that making the evidence of the mass graves available to European governments will change minds about the nature of the militants who were present in E. Aleppo. Those governments have always known they've been aiding and abetting mercenaries who routinely commit atrocities. Nobody has to show them mass graves to make the point. It's just that the governments who actively aided the mercenaries didn't think their complicity in war crimes would be exposed. At first they assumed that Assad would be assassinated or driven out of Syria. After the Russians stepped in, the European leaders assumed the American government could cut a deal with Russia that would force Assad to step down. And it didn't dawn on them until a month ago that the Syrian Amy coalition could be completely successful in ejecting mercenary militias from East Aleppo -- meaning that it would have full reign to inspect every square foot of the area. Now all the biggest offenders can do is try to divert public attention by making accusations that the Syrian (and Russian) militaries also committed atrocities in Syria. Human rights observers and the media have recorded numerous examples of massacres and organized torture, perpetrated by the government, opposition, and the Islamic State group. In other words, the opposition fighters we've supported are no worse than the Syrian government. The information the Russian military is making public about Aleppo should change the attitudes of Washington and its European allies, military expert Andrey Koshkin told Sputnik. In an interview with Sputnik, military expert Andrey Koshkin suggested that the information on Aleppo which was disclosed by the Russian military may change attitudes toward the so-called moderate Syrian opposition in Washington and among its European allies. The interview came after Russian Defense Ministry spokesman Maj. Gen. Igor Konashenkov said that mass graves of torture victims have been uncovered in liberated Aleppo in northern Syria. "Mass burial sites of many dozens [of Syrians] have been found; they had been subjected to brutal torture and [then] murdered. In many cases, body parts are missing; most victims had been shot in the head. And this [discovery], it seems, is only the beginning," according to Konashenkov. Konashenkov further revealed that militants from the "moderate opposition" in eastern Aleppo had booby-trapped nearly everything with explosives before leaving the city, including toys, streets, entrances to premises, cars and motorcycles. Commenting on this, Andrey Koshkin said that the US and European countries should review their stance on the moderate Syrian opposition after the publication by Russia of information related to Aleppo. "After the liberation of Aleppo from militants, unbiased information on the matter has witnessed demand, even in the West," Koshkin said. He cited the current efforts of "many journalists" to disclose the details of the making of fake videos and information. These were targeted at justifying the actions of Syria's moderate opposition and terrorist organizations, as well as discredit Russia's activity in Syria. "It was an information and political trap, with both Geneva and the information space repeatedly generating the idea of a 'moderate opposition'. Actually, it was a line aimed at supporting militants," he added. Konashenkov, meanwhile, added that seven large ammunition depots, enough to arm several infantry battalions, had also been discovered in Aleppo. On December 22, Syrian government forces assumed full control of Aleppo as the last convoy with militants left the embattled city. Syrian government forces have been fighting multiple opposition and terrorist groups, including Daesh and Jabhat Fatah al Sham, formerly known as Jabhat al-Nusra, or Nusra Front. The Syrian civil war has been ongoing since 2011. As Christians around the world celebrate Christmas, you might be surprised to learn that the holiday season is also observed in Iran, a predominantly Muslim nation where Christians make up less than 1% of the country's population. Christianity however has a long history in Iran, dating back to the early years of the faith. It has been practiced in the country longer than the state religion, Islam. According to the country's statistics, today there are at least 600 churches for 300,000 – 370,000 Christians in Iran, most of whom are Armenians who are followers of the Oriental Orthodox branch of Christianity. Assyrians, Catholics, Protestants and Evangelical Christians make up the remainder of Iran's Christian population. Some Iranian Christians celebrate Christmas on December 25 and New Years' on January 1, while Armenians celebrate Christmas at the same time as the Epiphany on January 6. ​Decorated trees, along with Nativity scenes of the Virgin Mary, Joseph and baby Jesus, can also be seen. The festive mood, however, is not just limited to the Christian neighborhoods of Tehran, as some shops, especially those in the northern parts of the city, dedicate at least a part of their shop windows to decorations such as candy canes, snow globes and Santa Claus figures. ​Unlike other countries in the region where public celebration of Christmas is limited to hotels frequented by foreigners, there is no such restriction in Tehran. 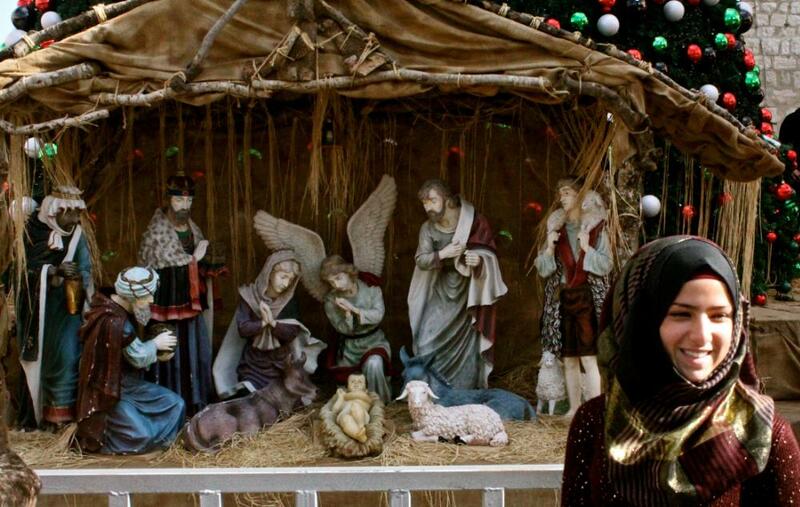 The sale of Christmas ornaments, which during the first years of the Islamic Revolution was limited to Christian districts, can now be seen around town. Over the past decade, celebrating Christmas has become increasingly popular among young Iranians, regardless of their religion. The trend has some religious basis, as Muslims acknowledge the birth of Jesus Christ and recognize him as one of God's holy messengers. Christmas in Iran is popularly known by the name of "Little Feast." The festival is preceded by "Little Fast," or 25 days of fasting from animal products. The ritual is observed mainly by the Assyrians from December 1, and requires abstaining from meat, eggs and even dairy products such as milk and cheese. Plenty of meat is cooked up for the Little Feast celebrations though. The main dish for Christmas Day is a kind of chicken barley stew, popularly known as "Harrissa," which is cooked in large quantities and is stored and eaten for several days. This year, shoppers lined up for selfies with one of several Santas stationed outside stores on the main drag in Tehran, making Iran an oasis of peace in a region beset by war. See how many types of musical instruments and styles you can spot in Rostam Mirlashari's 2013 version of this old Iranian love song for the Coke Studio Pakistan television series. Coke (yes, Coca-Cola) Studio Pakistan (which inspired an Indian version and one in MENA) has been facilitating a musical revolution that reminds me of the incredibly syncretic music called mbalax that arose in Senegal in the early 1970s. The roots are different in the present revolution but once musicians from widely different traditions from around the world start jamming together it's amazing what they can produce. One note about the Irish fiddling music that finds its way into Laila O Laila. If, as some research suggests, the Celts originally hailed from the Indian subcontinent stretching into the Middle East, one might say that the fiddle solo for the song is the closing of a large musical circle. Mirlashari grew up in Sistan-Baluchistan, a province of Iran, and was inspired by his parents who were both singers. He studied civil engineering, worked in the building industry, and was a director of a construction company in Minab. In 1991, the political situation and fear for his life in Balochistan convinced him to leave Iran and move to Sweden. In 1994 he established a band made up of a mix of musicians from Balochistan, Sweden, Africa and a few European countries. He called the band Golbang (pronounced Gol-bāng). According to Pakistan Idol, he is known as "the prince of Balochi music." Laila O Laila - YouTube. Click on the "CC" (subtitles/closed captions) button on the YouTube screen for English translation of the lyrics. "Assad visits Christian villages in Damascus on Christmas"
BEIRUT, LEBANON (4:05 P.M.) - Syrian President Bashar Al-Assad with his wife and children visited the historical Christian village of Saydnaya in rural Damascus on Sunday in order to commemorate the Christmas holiday. 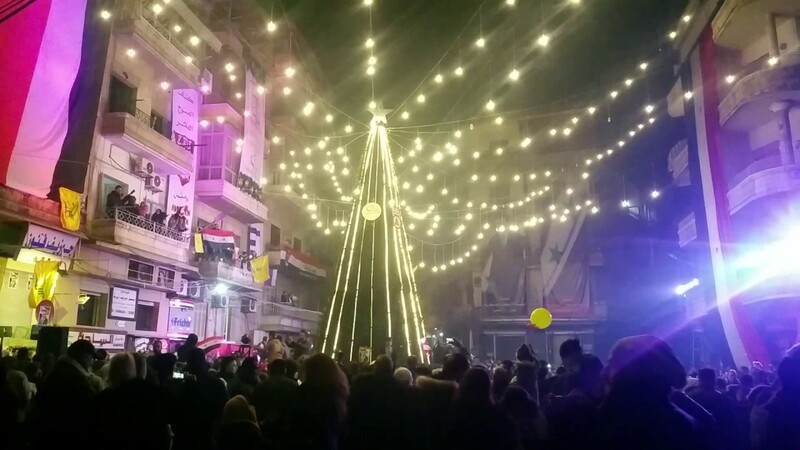 Last year, the Assad family traveled to the liberated town of Ma'aloula to celebrate Christmas, marking their annual holiday visit with the Christians of Syria. 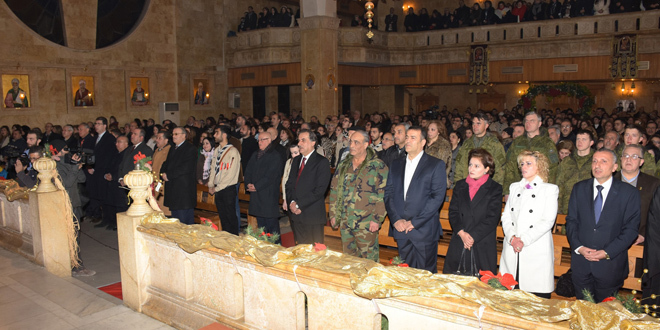 (Damascus) Christian denominations in Syria celebrated on Sunday Christmas and held masses and prayers in churches. "People are actually going out onto the streets more often and are gathering together near the Christmas tree. That is surprising because a bomb was placed underneath it and there was a blast. The bomb exploded on the pavement without damaging anything. " Remember Pierre Le Corf, the outspoken young Frenchman who's been living and working in western Aleppo for the better part of a year? Well, he decided to play Santa. “There is a bit of everything. For example, board games, toy cars for kids, superman figures with candy inside. There are balls, dolls and small gears for soap bubbles. All these little dolls are for girls, so are the skipping ropes, machines for soap bubbles, etc.,” Le Corf said. He further said that together with his team they worked to collect different gifts not only for Christmas but also to make contact with people, especially with children. "It’s a beautiful day and soon a new year full of promises, Inshallah, of peace, reconciliation, and reconstruction. Remember that you’re stronger than this war through hope and imagination. Every day is a new day full of lessons, sometimes hard but it makes you stronger. You are a superhero in your own way, because you are who you are, a unique person with your own story, experiences and impact on people around you. These last years were difficult in Aleppo, some of you have lost their dreams, their trust, their self-confidence, family members or friends … but never give up, never stop believing in yourself, never stop being who you really are and whatever happens, don’t forget to live, to smile. It’s not always easy, for sure, but we believe in you. Le Corf told Sputnik that everyone is involved in the program in their own way. People are actually going out onto the streets more often and are gathering together near the Christmas trees. According to the founder that is surprising because a bomb was placed underneath it [the tree in Azizieh Square] and there was a blast. “The bomb exploded on the pavement without damaging anything so the war still goes on, it is not yet over. People came out onto the streets with some family members going to the park. It is strange to see so many people on the street, whereas before people were afraid to go out at a certain time due to missile attacks,” Le Corf said. It's a blessing that people can almost feel secure, knowing that all is not quite over but people are really happy. There is a feeling that a new life is beginning, a new page is opening. The founder of the NGO recalling his stay in Aleppo said that the churches are located next to the mosques and there is no difference between people. Talking about the general outlook of the Syrian people, the strongest message would be that they do not hold evil against anyone. “In recent months, in recent years there has been a lot of anger because every day people are getting shot by the terrorists, people are dying, children and families. Syrian government forces have been fighting against multiple opposition and terrorist groups, including Daesh and Jabhat Fatah al Sham, formerly known as Jabhat al-Nusra, or Nusra Front. The Syrian civil war has been ongoing since 2011 and has claimed hundreds of thousands of lives, displacing millions of people. In the meeting room after her show is off air, Sama tugs at her hair, buzzing with the emotions that have come down the phone lines [from Syria] into the studio. "Did you hear the audience?" she asks me. "I mean they all want to forgive -- it's just stunning!" She shakes her head in disbelief. "You know, I would have a problem forgiving you if you slapped me or if you took my cup of tea. Yet these people inside Syria who suffered bombings and missiles and death -- they say we must forgive. The Syrian people are really amazing." (Provinces) Christmas mass was held at St. Elias Greek Orthodox Church in Aleppo city, presided upon by Greek Orthodox Patriarch of Antioch and All East John X Yazigi. In his Christmas sermon, Patriarch Yazigi said that no words can describe the feelings brimming in the hearts in these days which witnessed the great victory of Aleppo and its salvation from terrorism, saluting the people of Aleppo for their steadfastness and their commitment to their land. Yazigi prayed to God to preserve President Bashar al-Assad, to grant the Syrian Arab Army victory, and to bless the entirety of Syria with peace and security, and he also prayed for the return of the abducted bishops Paul Yazigi and John Ibrahim who were abducted by terrorists in Aleppo countryside in 2013. 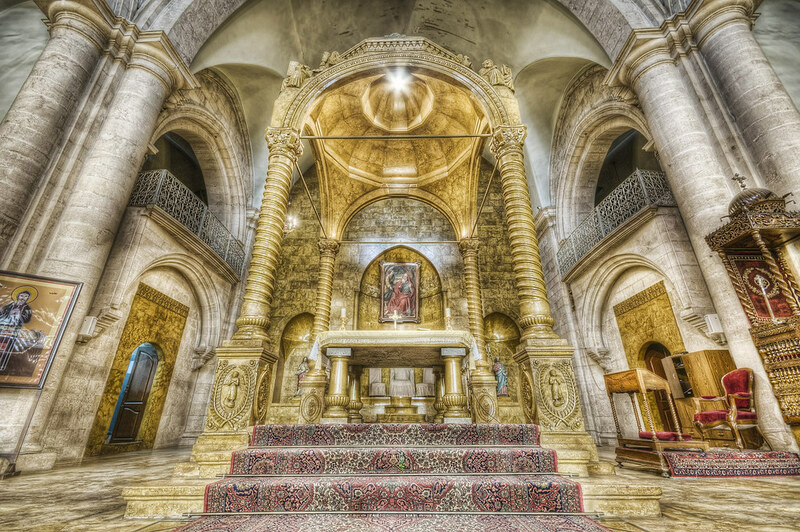 Christmas mass was also held at the Malkite Greek Cayholic Cathedral of the Dormition of Our Lady in Damascus, presided upon by Archbishop Joseph Absi. During the mass, Absi said that peace is looming in the horizon, and that Syria will become once more a paradise, affirming that reconciliation is the only way for Syria to return to security, happiness, and prosperity. In Sweida province, Christmas services and masses were held in several churches including the Bosra, Horan, and Jabal al-Arab Greek Orthodox Archdiocese, the Jesus the King Church, the Good Shepherd Church, and the churches of Shahba, Ora, and al-Qarya. In the same context, the tallest Christmas tree in the southern area was lit in front of Unwanak resort in Sweida. Meanwhile in Hasaka city, the Syriac Orthodox Cathedral held services at the Virgin Mary Church, which includes Christmas hymns, lighting a Christmas tree, and inaugurating a nativity scene. No report of survivors among the 92 people aboard the plane. The tragedy is especially poignant because 64 of the passengers were members of Russia's great Alexandrov Ensemble choir and orchestra; it reminds me of the plane crash in 1961 that killed the entire U.S. figure skating team. Elizaveta Glinka, famous Russian charity leader was reportedly among the passengers of the crashed aircraft, delivering medication for a university hospital in Latakia, Syria. The plane disappeared from radar two minutes after taking off from the resort of Sochi at 05:25 (02:25 GMT). Debris and several bodies have been found, with no reports of survivors. The defence ministry said the Tu-154 was carrying soldiers, 64 members of the famed Alexandrov military music ensemble, and nine reporters. President Vladimir Putin has ordered a state commission to look into the crash and sent his condolences to the families and friends of the victims. Mr Konashenkov said the plane was carrying passengers to a New Year's performance for Russian troops deployed in Syria. The performance was scheduled to take place at Russia's Hmeimim air base, near Latakia. "Are India and Pakistan set for water wars?" "Aleppo airport to be re-opened as Army triumphs"
"East Aleppo evacuation underway: U.N. official"